Today was a very early day (6 AM), which began with breakfast along the Nile River at sunrise. We began the day driving north along the west bank of the Nile. drove through the west bank of the Nile Delta and stopped in the fields to see the fertile crops of sugar cane, dates and papyrus, among other things. The irrigation farming depicts the way of life in the Nile Delta farming which is basically the same level development as in ancient Egypt. Unfortunately, as we learned, the Aswan Dam has significantly decreased the extent of the fertile soil and the productivity. We then stopped at a local brick factory to have the workers demonstrate brick-making. They mix the clay with dung and water, then pour them into molds of bricks, and let them dry. Several people made their own bricks from this. Let’s just say, none of us should change our career paths (see picture above). We then drove to the Dier Al-Medina, which is the site of the homes of many Pharaoh’s workers in the New Kingdom. 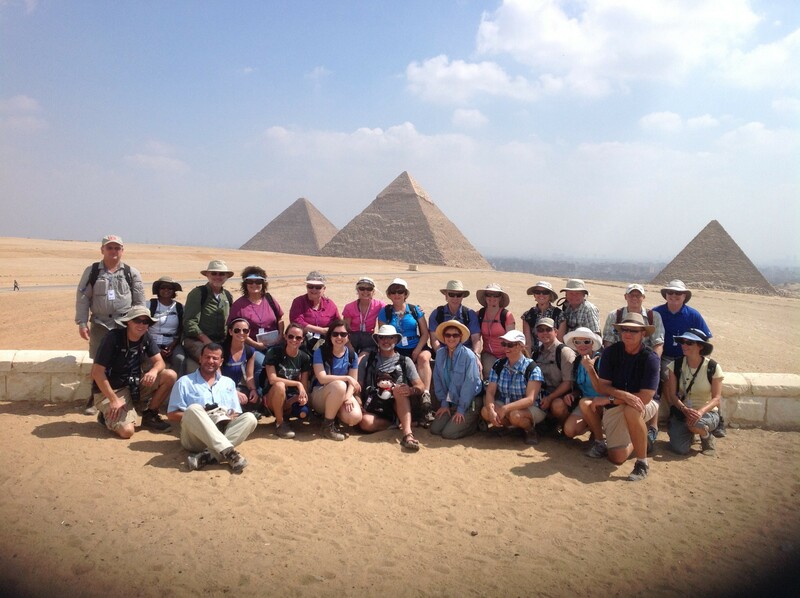 These people volunteered their lives to dig the Pharaoh’s tombs. 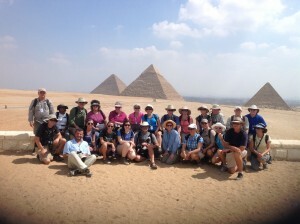 These tombs have been excavated and are the site of the famous King Tut’s tomb! This place also contained the Temple to the god Hathor (the Sky Goddess), and we had a few lectures on God hardening Pharaoh’s heart and the parting of the Red Sea (also called the Sea of Reeds). After exploring these sites, we had an amazing boat ride on the Nile, and ended up jumping in! That was an unexpected, but amazing surprise. This is right in the area where it is rumored that Moses was placed in the reeds to escape Pharaoh’s killing decree. Seeing these elaborate tombs and the correlation between so many of their myths/traditions and the Christian traditions really put the Old Testament into perspective. As George would say, in his opinion, the Bible was written for us, but not to us. This place provides an insightful context of much of the Old Testament and sheds light on many hidden truths and underlying themes of the Bible that are difficult to see with our Western eyes. George has been treating us like Kings and Queens and has provided us with amazing insight and spiritual food and a foundation that many of us will have the blessing to live with the rest of our lives. We are looking forward to exploring the Holy Land over the next many days!